Welcome to the first episode of the php[podcast], a new podcast from us at php[architect]. We hope you’ll enjoy listening to learn about the latest issue of the magazine, upcoming conferences, and interviews with our contributors. In this episode, we take a look at the August issue and the topic of authentication and authorization in web applications. Oscar Merida talks about the launch of the podcast. Eric and John look inside the August issue. A chat with Eli White about the changes to php[world], our fall conference near Washington D.C. This is awesome, but where’s the RSS link for the podcast so we can add it to our podcast app of choice? The feed is https://www.phparch.com/podcast/feed/episodes/ I’m figuring out how to make that auto-discoverable. Is there any way to catch this in the ios podcast app? Willem, I’m waiting for Apple to approve the podcast feed into the iTunes store. I believe then it’ll appear in the podcast app. Thank you for the feed URL! I’m using BeyondPod (and Android), so having the feed URL is essential if you aren’t already in their directory. 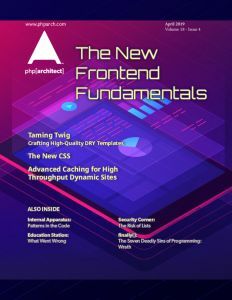 Looking forward to getting some quality new content delivered on PHP development. Thanks for creating the podcast – there are not that many good ones about PHP. I think you could make the podcast more attractive by providing more content there (e.g. more “meat”) – the first episode is 90% about advertising what is in the magazine (without sharing any knowledge) & about upcoming PHP conference. Is it available in Google Play? I have submitted it to the store. If you’re on Android, you can subscribe here.